When the United States declared war on Spain in 1898, Archie Campion saw an opportunity for a practical demonstration of his creation's combat capabilities. 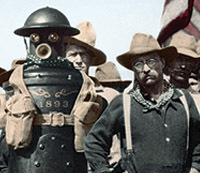 Aware of Theodore Roosevelt's fascination with the latest technology, Campion wired him to request that Boilerplate be included in Teddy's volunteer unit. The offer was accepted, and in late June, Campion and Boilerplate journeyed from Chicago to Tampa by rail. At Port Tampa, American ships were forming up for the transport of troops to Cuba, to engage the occupying Spanish army. Campion briefed Roosevelt on Boilerplate's operation, then remained behind as the fleet steamed southeast.The Spanish-American War was under way. On June 22, U.S. forces landed without opposition at Daiquiri. The following day, they advanced to Siboney and established a supply base. Insurgents reported that Spanish entrenchments were only a few thousand yards northwest at Las Guasimas. Colonel Wood, in command of the dismounted Rough Riders, ordered a probe of the Spanish position. It was June 24, 1898. Boilerplate was about to engage in combat for the first time in the five years since he had been constructed for just such a purpose. In the left flank of the American advance was Lt. Col. Roosevelt. On one side of him was famed journalist Edward Marshall of the New York Journal, and on the other side was Boilerplate, each armed with the latest Kraig rifles. A skirmish ensued in the jungle terrain, and every treeline became a battleground. 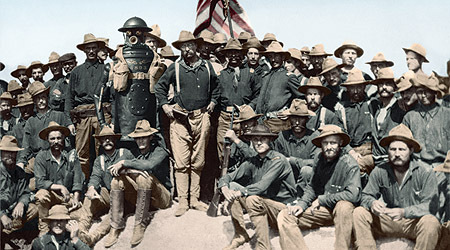 Boilerplate with the Rough Riders. Click on photo for a larger version. Detail of Boilerplate with Teddy. Marshall was wounded along with a score of Rough Riders, but the enemy were driven back to a clearing that contained a fortified blockhouse. Roosevelt, sensing the reaction the Spanish might have to Boilerplate, ordered the mechanical man to advance on the position. The effect was dramatic enough: the Spanish troops abandoned the blockhouse and retreated toward Santiago. Only the defenses at San Juan Heights stood between the Americans and the capital of Cuba. On July 1, U.S. forces were in position to assault those hills. The charge was disorganized but determined. Lt. John "Blackjack" Pershing led the Buffalo Soldiers of the 10th Cavalry, and Lt. Col. Roosevelt led the Rough Riders, the 1st Volunteer Cavalry. Teddy described it as "my crowded hour." "I galloped toward the hill, passing the shouting, cheering, firing men, and went up the lane, splashing through a small stream; when I got abreast of the ranch buildings on the top of Kettle Hill, I turned and went up the slope. Being on horseback, I was of course able to get ahead of the men on foot, excepting my mechanical 'mule,' who had run ahead very fast in order to get better shots at the Spaniards, who were now running out of the ranch buildings." The "mechanical mule" referred to by Teddy is, in fact, Boilerplate. Roosevelt acknowledges Boilerplate's contribution and even admits that the first troops up the hill were those of the all-black 9th Cavalry under captains Taylor and McBlain. The national media, however, gave the spotlight to the Rough Riders. A nation that had been starving for wartime glory, and now had stepped up to take its place on the world stage, could hardly admit to anything other than what author M. Demolins declared as Superiorite des Anglo-Saxons. 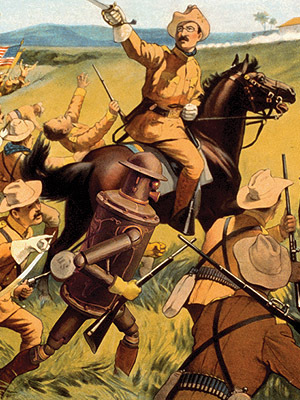 If the heroics of the Buffalo Soldiers could be ignored, then of course so could the acts of what was considered a soulless automaton. The following month, Boilerplate shipped back to Florida with the first wave of returning troops. Two days later the Spanish fleet, anchored in Santiago harbor, was destroyed while attempting to break through the American naval blockade. Click on image for uncropped version. After a two-week siege of the capital, General Toral surrendered the city on July 17. The final peace treaty was signed in Paris on December 10, 1898. Among its terms were that the U.S. would annex the Philippines,the Pacific Islands, and Puerto Rico. Hawaii and Panama would soon follow as overseas territories. The United States was now a world power, and the Spanish-American War set a precedent for its involvement in the Caribbean that continues to this day. Boilerplate's media profile was probably highest during the Spanish-American War. Stephen Crane mentions him in one dispatch, Richard Harding Davis in two others, and (as quoted above) Theodore Roosevelt briefly writes about the "mechanical mule" in his book, The Rough Riders. All such accounts are dismissive of the robot's potential and personality. According to writers like Crane, the great human qualities--honor, valor, and sacrifice--were characteristics Boilerplate could never hope to possess. This can perhaps be attributed to the dawn of automation in the Victorian era, when machines were beginning to supplant people in various occupations. To contemporary writers, Boilerplate may have represented a threat to the human spirit.